My 2013 venture into Dark Chocolate Mousse has already taught me a few things! For instance, I had been wondering whether the texture of my first mousse, after it was chilled, was meant to be so firm. I shouted, “Seize the Chocolate!” (Or in Latin thanks to Google Translate, “Carpe Socolate!) ” My definition: “Seize” is what one does immediately after it is cool enough to eat. No, that can’t be what they mean. Honestly, I had not heard “seize” used like this before and didn’t know what it meant as a cooking term. Hmmm . . . maybe I ought to know since it seems to be about chocolate. As a culinary term, it refers to chocolate that becomes a stiff thick mass when being melted. It is a result of just a tiny amount of liquid or steam coming in contact with the chocolate when it is being melted, causing it to harden and become clumpy. The seized chocolate can be salvaged by adding a very small amount of cocoa butter, clarified butter or vegetable oil and stirring until the stiff mass smooths out. Do not add more than one tablespoon of the butters or oil per six ounces of chocolate. If the salvaged chocolate is going to be combined with other ingredients, realize that the texture of the finished product may be affected. If the mixture starts to seize or break down, immediately stir in 1 to 2 tablespoons of the whipped cream to smooth out the mixture. I had a feeling that seizing chocolate was undesirable. I don’t recall if my dark chocolate came in contact with any steam or water, but you can be sure future melted chocolate will be protected from seizing at all costs! And here’s another question: If your chocolate seizes, do you say it had a seizure? This entry was posted in Chocolate, Cooking, Definitions and tagged Chocolate, Chocolate Mousse, cooking, cooking definitions, melting chocolate, Recipes, what does seize mean by mycookinglifebypatty. Bookmark the permalink. At least we have 11 more months of Dark Chocolate Mousse tomfoolery to play with. I’m sure we’ll be experts before long! I think you would know instantly if your chocolate had seized. It turns into a lumpy mass resembling over-cooked crunchy ground meat. My mousse, as well, was firmer than I had expected once it set. Did you use cooked eggs to thicken it? My guess is that we let the custard cook too long before pouring it into the mousse cups… Any one else have any ideas? 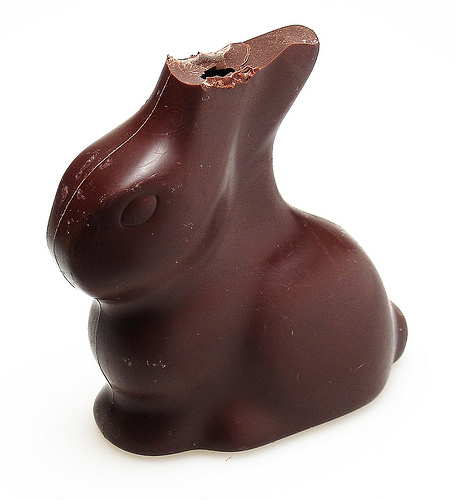 PS – Poor bunny! What’s that, you say? Thanks for the description of seizing chocolate. I would say mine didn’t seize. It was just very, very sticky when I melted it. The egg yolk and sugar was gently heated as a separate mixture and the recipe said it should become foamy (beating and heating at same time) and it should be too hot to touch with your fingers. Well, I live in a high altitude region and everything takes longer to heat up. The yolk mix developed into a good consistency but was only partially heated so we stopped at that point. Luckily the eggs were only a day old from the hen to us so I wasn’t too worried about heating up the egg more. You could be right that because the custard wasn’t heating up it actually stayed on the stove too long. Thanks Vinny! Good information to know. Thanks for sharing. Yes, I think the Red Queen had the right idea on this one!